If you rent out your property you must be aware that you have a legal obligation to fully maintain the electrical safety of it even if it is a brand new purchase without any certification. We can provide a full audit for you and ensure that you have all of the correct certification before the authorities question your credentials. Our expert service also ensures that you maintain an excellent service for all of your tenants so that the rent will keep coming in! If you are renting through a letting agent then we will ensure that they are happy the building is fully compliant with regulations at all times which means you will always have a tenant in place. All of our engineers that provide electrical landlord services are experienced and are fully qualified to maintain the highest standards. They have all worked in rented properties for many years on behalf of both tenants and landlords alike. 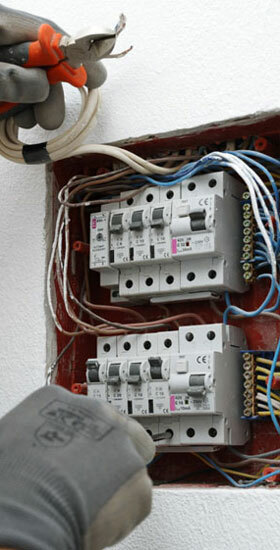 If you need electrical work for commercial or residential lettings, with us you are in the best hands. Our Landlord services are particularly useful if you rent out multiple properties because we will provide you with a service agreement to cover all properties and the electrical maintenance required for each. We will even keep on top of the inspection schedule so that you are always notified when the next electrical inspections are due. If for any reason after an inspection the standards are not quite there, we will provide the landlord or agent with a very reasonable quote and explanation of any work that needs to be completed. Contact us today on 0113 393 4546 | 07824 773 517 to receive a free, no obligation quote for your property. We are happy to recommend CRE Electricals (Chris Wilson) to any Landlord or Letting Agent – without hesitation. As an electrical contractor Chris/ the company have attended to our requirements when and where necessary, promptly, efficiently and at a ‘cost effective price’. He has been courteous and helpful; accommodating and professional and is retained among our list of ‘trusted’ contractors for the foreseeable future. I recently moved into a new house and needed an electrician to renew my fuse box and install some new spotlights. Chris Wilson from CRE Electricians LTD was recommended to do the work. After contacting him and arranging a time to view the house he quickly came back with a quote which I found to be very reasonable. When he came out to do the work he was on time and was very tidy. I would be happy to recommend CRE Electricians LTD to any one else that might need his services. I was very happy with Chris’s work he was prompt to get in touch and estimate the job, both the estimate and work were carried out on a weekend which was very helpful. He charged a fair price for his work which was I felt to a very high standard. I am happy to use his services again and also recommend to friends and family. Thank you for dealing with my request so prompted. You worked tidily and efficiently and didn’t leave me with any follow up work other than to pay your bill, which I found to be very reasonable. Thank you once again. I would have no hesitation in recommending your services to friends and associates. As a local businessman I have dealt with and used many local trades’ people over the years. I have therefore come to recognise the value of good customer service and quality of work. I have been very impressed with your level of service and value for money. I will certainly have no hesitation in recommending you to my business contacts, family and friends. We required supply and install of 8 6ft Fluorescent light fittings in our Remnants area of our Carpet Factory at Holbeck Mills, Chris arrived on site when he had arranged and carried out the work with great expertise. I would certainly Recommend Chris of CRE Electrical Services to all my contacts requiring a Professional Electrician. Chris has also made it possible for me to view my live CCTV feeds online or on my iphone and his work will be continuing over the coming months. I am extremely happy with the work that Chris carried out for me and would have no hesitation in recommending him to any friends, family and contacts for all general electrical and specialist CCTV/security system work. I decided to replace the old fuse board fitted on behalf of my parent’s home. Chris went to inspect the job and explained both the cost and roughly how long it would take him along with some additional work which my parents decided to have done. My parents were very pleased with his professionalism and workmanship and would not hesitate to recommend him to others who might require the services of an electrician. Chris also provided technical advice on security lighting, which I subsequently followed and asked him to install. Again, I was delighted with the work.I found Chris to be knowledgeable, polite and trustworthy. I will certainly be recommending him to friends, family and colleagues in need of an Electrician.